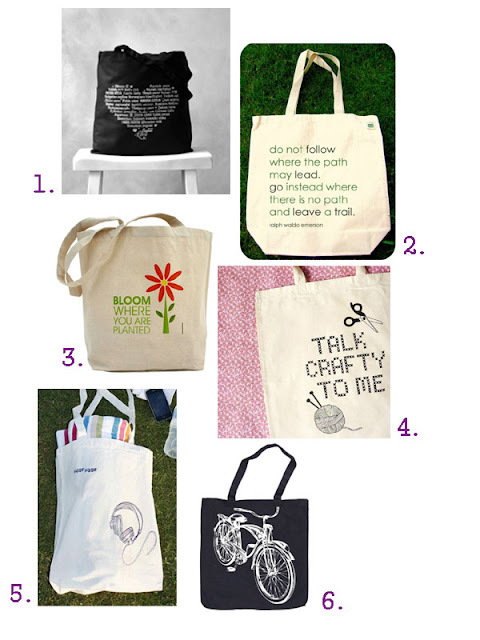 For this weeks Fabulous Friday Finds I thought I'd share some handmade tote bags. Tote bags are so handy and are a great alternative to using plastic bags when shopping. Enjoy! 1. The Love Languages Tote Bag by The Bucktoothed Bunny. 2. The Life Quote by Emerson on a Recycled Cotton Canvas Tote by Bunkle Berry Studios. 3. The Bloom Where You Are Planted Tote by Pamela Fugate Designs. 4. The Talk Crafty To Me Tote Bag by Pannikin. 5. The Doof Doof Calico Tote Bag by Sideline. 6. The Bicycle Bike Black Canvas Tote Bag by Happy Family.